Welcome to Freezer Food Friday – the Gluten Free Edition! Head over to MJ’s blog for Freezer Food Friday and join in the fun! If you have a great gluten free recipe that freezes well, leave a comment with the link, and I will add you here so all of us gluten free friends can share! Thanks! In the fall, I like to have apple pies on hand. It sounds like a lot of work up front, but using an apple peeler/slicer and doing each step by itself (letting things chill between the steps) makes it not such a hands on project. I would rather make up a bunch of pie crust at once and not deal with it for each individual time we would like a pie. However, if you would like to just freeze the filling without putting into a pie, divide the filling into four separate freezer containers or freezer bags. When ready to bake, thaw your filling, make your crust and bake. Freezing in bags is a good idea if you do not have a lot of freezer room. You can use the filling also as a base for a crisp or cobbler or warm it up and top pancakes with it. I am saving one of the pies for Thanksgiving, one for Christmas, one for fun, and baking one to eat right away. Toss the apple slices with the lemon juice in a large bowl. In a large stock pan, whisk sugars, cornstarch, cinnamon, nutmeg and salt. While still whisking, slowly add apple cider. Put pot over medium-high heat and bring to a low boil. Boil for two minutes, stirring constantly. The cider mixture will be very thick. Add apple slices and lemon juice to pan and carefully fold apples into cider mixture. Cook for about 8 minutes, stirring often. Apple will be partially cooked and more tender, NOT mushy. Allow mixture to cool for half an hour uncovered, then place into the refrigerator to cool completely. After the filling is cool, you can divide into four freezer containers or freezer bags, label and freeze. If making pies, divide into pie tins containing chilled pie crusts. Return filled crust to refrigerator while making the pies’ top crusts. Put top crust on pie, flute crust edge, cut steam vents in the crust. You can brush the top of your pie with an egg wash of and egg mixed with 1 tablespoon of water (for egg free use flax seed goop using golden flax), sprinkling with cinnamon sugar to finish the crust. Now, freeze your pie in the coldest section of your freezer. When frozen, wrap your pie with freezer weight plastic wrap or slip into a large freezer bag, removing all the air. Label pie with type of pie, date and baking instructions. When ready to bake your pie: Remove from freezer. Unwrap pie and place on a cookie sheet. Bake for 350 degrees for 50 min to and hour. 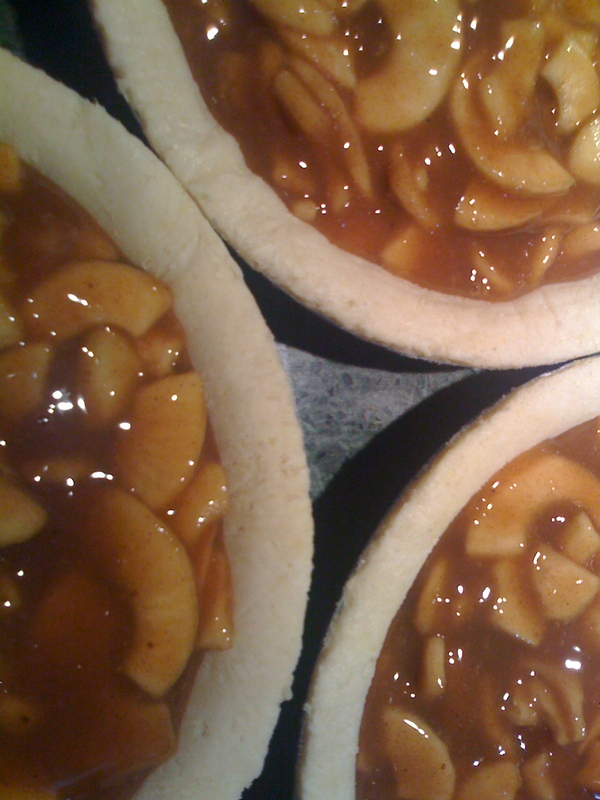 Pie is done when apples are tender, crust is golden and filling is bubbly. Allow pie to completely cool before slicing to allow the filling to set. If you would like to bake one right away: Preheat oven to 375 degrees. Bake 35 to 40 minutes. Allow to cool for at least 1 1/2 to 2 hours before slicing. **For the freezer pie, you will need to make 4 pie crust recipes. I usually make 2 double recipes and divide up the dough into disks for each crust before chilling. Whisk together rice and tapioca flour, potato and cornstarch, sugar, baking powder, xanthan gum, and salt into a mixing bowl. Cut cold shortening into dry ingredient. Blend with a pastry cutter until shortening is incorporated into the dry ingredients. Beat egg with vinegar and 2 tablespoons cold water; Pour over flour mixture and toss together with a fork. If more water is needed for dough to hold together when squeezed, then sprinkle one tablespoon of cold water at a time onto the dough, up to an extra 1/4 cup water. Form dough into two balls with your hands. Place each dough ball onto a sheet of plastic wrap and flatten into a disk about 1 to 1 1/2″ thick. Wrap disks well in plastic and chill for at least one hour. Remove dough from the fridge. Working with one disk at a time, unwrap dough. Place on plastic wrap and add another sheet of plastic wrap onto of dough disk. Roll out the dough between to sheets of wax paper. The dough should be about 1 1/2 inches larger in diameter than the pie pan. Peel top sheet of plastic away from dough. Slip hand underneath plastic wrap and crust. Using the plastic wrap to help support the dough, flip crust into pie pan. Remove the sheet of plastic wrap. Trim excess dough and crimp edges to form a decorative border. You can freeze disks of pie dough. Wrap the disks well. When ready to use, allow to thaw over night in the refrigerator. When thawed, shape and bake. This entry was posted in Dairy Free, Desserts & Treats, For the Freezer, Freezer Food Friday, GFCF, Gluten Free. Bookmark the permalink. Wow! Looks good! What a post!